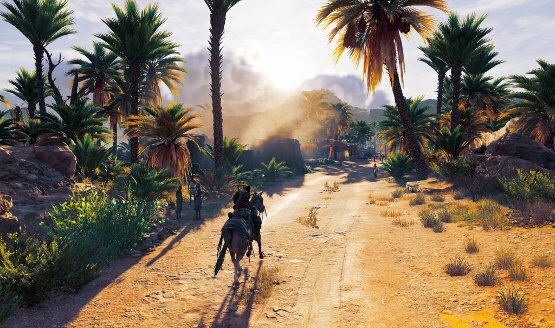 After a year without a traditional assassin’s adventure to grace the holiday season, Ubisoft Montreal takes the player to the sunny and bloody Egyptian Empire near the turn of the second to last millennium. Assassin’s Creed Origins is filled with charismatic historical figures, and a world that may be too large for one gamer alone to explore. Despite this, the only thing that really matters is if it can rival the Ezio-era of titles and restore the once illustrious reputation of the decade old franchise. The political and social makeup of the game’s world, which takes place around 50 BC, is probably the most hectic era that Ubisoft could have chosen to set their period piece in. Dozens of incredibly important figures will just be name-dropped, like the funnily named Plutarch and the long dead Xerxes, and it really made me want to take a look into the actual history of the world at the time (which is something the game will explore further when the educational free-roam mode drops next year). Players take control of Bayek, a Medjay warrior who is tasked with protecting the people of Egypt, and is thrust into meetings with important figures far more illustrious than his usual company of modest companions. There’s a real sense of emotion woven through the entire plot. Dozens of moments, that could’ve easily have been routine scenes in other games, are made captivating thanks to the combination of exceptional writing that’s paired with stellar voice acting. 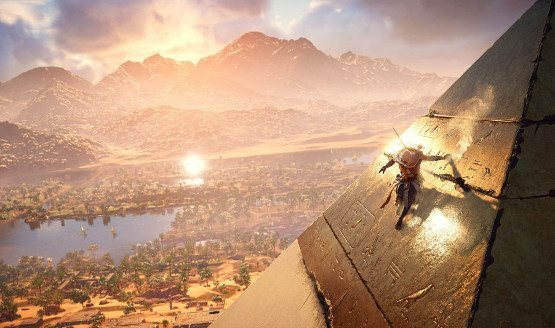 It’s not easy to make the player care about the many characters they meet on their trek across Egypt, but Ubisoft manages to do it without any issue. I found myself quickly becoming attached to my loyal companions in less than an hour of play, and that sense of loyalty only grew as the game continued. This feeling is also extended to the world at large, wherein it feels authentic, and interactions between characters can be genuinely moving. I quickly began to distinguish every location, major or minor, that Bayek came across, and etched them into my memory. This doesn’t just apply to major cities like Giza and Alexandria, but also to small villages that get to tell stories of their own. Every location brings with it a unique tale that allow them to be remembered. Seeing each area have its own set of issues and societal ills that Bayek must solve, makes it feel all the more real. Every farmer and merchant in those towns plays off one another to craft a world that not only feels connected, but meaningful. It’s this key area that separates Origins from many other role-playing games, wherein I would regularly lose track of which locale harbors a certain industry, or what villainous sub-plot I was supposed to be keeping track of. 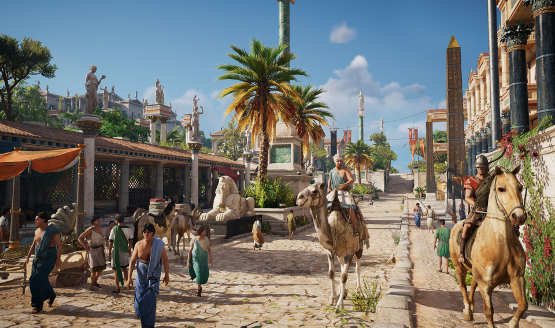 It’s remarkable that in a world the size of Origins manages to feel like one that is inhabited by individuals, not just wayfarers that toss sidequests at the player. I found myself thinking about how a certain character was coping dozens of hours after I had last seen them. It’s unlike anything I’ve experienced in gaming, and it goes to show just how much effort Ubisoft Montreal have put into creating a living world for the player to explore. While you’re out and about playing hero, you’ll notice some changes to the standard Assassin’s Creed formula when it comes to combat. The developers have taken a more meaningful approach, adding in the option to select a difficulty level for the first time. This results in a more tactical affair that has players locking onto targets, and patiently avoiding attacks instead of slaughtering fourteen guards before a smokescreen clears up. While I eventually enjoyed the changes, it took far too long to happen. Many of the really satisfying combat abilities require being a higher level, and I found myself pleading for some more combos early on. The weapons you carry are now categorized by rarity, and it seemed as if luck was on my side as I managed to find a gluttony of legendary variants so early on. What’s great about this new system is the ability to carry the same weapons from the opening sequence all the way to the end of the game by upgrading them at shops for a certain amount of coins. This made me feel a connection to my weapons, as I didn’t want to dismantle my trusty axe with the ability to give me some health back based upon the damage I was dishing out. Sure, there was always a shiny new toy being sold at the local blacksmith, but it’s hard to part with a weapon after dumping thousands of coins worth of upgrades into it. One of my favorite actions in Origins was just discovering new locations across Egypt. I constantly was taking pictures in its Photo Mode while I walked around the immaculately crafted cities, but there are two problems that I consider cardinal sins present in the game. These issues unfortunately stop it from reaching the level of some of its predecessors. The first is a sin committed by the same team that made Assassin’s Creed IV: Black Flag. I know you’ve heard all the hype and marketing material that emphasized the Origins part of the game’s title, but I’m afraid to reveal that this is yet another Assassin’s Creed game that doesn’t seem to want to be an Assassin’s Creed game from a story perspective. There is almost no causal connection between the game’s story and the franchise by which it names itself after. This isn’t a game about assassins, and to me that is simply unacceptable for a franchise that I would assume is attempting to cater to its fans. Origins begins with some interesting revelations, and then goes upwards of thirty hours with just a single, meaningful connection to the lore of the universe. Even its modern day Abstergo segments are over before they’ve begun. It’s especially frustrating when we’ve already gotten Assassin’s Creed titles that can tell great stories just by focusing on the lore. Assassins Creed Origins review code provided by publisher. For more information on scoring please see our Review Policy here.